A Rotherham-based engineering firm has been acquired two years after administrators were called in following a global downturn in the oil and gas market. Stainless Metalcraft has completed the sale of Whiteley Read to Glacier Energy Services for an undisclosed fee. Based at a custom built facility on the Gateway Industrial Estate at Parkgate, Whiteley Read has been associated with pressure vessels and the process industries since 1937. It manufactures vessels and columns in both ferrous and non ferrous materials up to 200 tonne in weight for many blue chip companies, such as BP, Centrica, Shell, Nexen & GDF. Joanne Hammond and Gareth Rusling of Begbies Traynor were appointed as joint administrators of Whiteley Read Engineering Ltd in 2016. Stainless Metalcraft, which is also a specialist in the fabrication of pressure vessels, acquired the assets and said at the time that it will serve the market under the Whiteley Read name and use immediate contracts in place to fill the Rotherham factory. The Chatteris-based business forms part of Avingtrans PLC's Energy & Medical Division and said that the sale marks the successful completion of Metalcraft's two-year turnaround plan for the company, which has provided valuable additional manufacturing capacity for its parent company while also processing new business. Aberdeen-based Glacier Energy Services delivers specialised services to the oil and gas, renewables, power generation and industrial sectors in the UK and internationally. It is expected to continue to operate in Rotherham as Glacier Whiteley Read. Austen Adams, managing director of Avingtrans, said: "We're delighted to be able to hand the business on to new owners in Glacier who have a shared appreciation of the heritage, skills and potential that exists at Whiteley Read. "When we acquired the assets back in 2016, we were keen to reinvigorate the brand while retaining skills and scarce, large-scale manufacturing facilities in the UK. From a standing start, the business is now turning over £2.5m per year and has worked on a number of flagship projects over the last two years, including a complete glycol regeneration plant for the Timimoun Field Development in Algeria and components for Storengy UK's Stublach Gas Storage Project Phase 2." 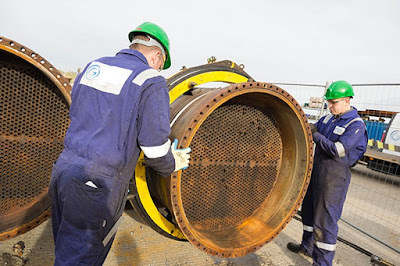 Scott Martin, executive chairman at Glacier Energy Services, said: "Whiteley Read has an excellent reputation in the market and is strategically a good fit for Glacier sitting alongside our existing capability in the design and manufacture of heat exchangers. As a result, the combined business will be able to offer a wider range of products to clients in the international energy market under the Glacier Whiteley Read brand."